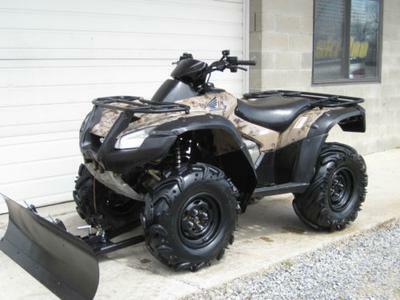 The 2006 Honda Rincon for Sale is a FUEL INJECTED , 2006 model HONDA RINCON 680 WITH ONLY 800 miles, 4X4 and a PLOW with RARE CAMO Plastics. The Rincon is in excellent used condition and the ATV's tires are also in good shape. The 680 starts right up and runs strong and smooth with fuel injection. Everything on it works like it's supposed to and we all know the Rincon's reputation and that nothing runs as good as a Honda! If you have any questions regarding the 680 4X4 Rincon or if you would like to make an appointment you can get in touch with me using the contact information I have posted below. Thanks to GoGoCycles Used Honda ATVs for listing my used 4X4! The 2006 Honda Rincon for Sale is in Schenectady NY NEW York USA and if you want to buy one helluva good used Rincon email me, KingaSeamanosr "at" aol "dot" com, before it's gone and don't forget to mention that you found this ad on GoGoCycles Motorcycle Classifieds www.gogocycles.com using the comments forms located on this page. I'll run it right to your door if you want me to.